Robert Morris was born on January 31, 1734 in Liverpool, England, the son of Robert Morris, Sr. and Elizabeth Murphet Morris. Robert’s mother died when he was two and he was brought up by his maternal grandmother. His father, Robert Morris, Sr., was born at Liverpool in 1700 and was an ironworker. He immigrated to America and began building a successful career in Oxford, Maryland. He came to Maryland about 1738 as agent for Foster, Cunliffe and Sons of Liverpool, for whom he purchased and shipped baled leaf tobacco to England. He was the originator of the tobacco inspection law, and had it passed over powerful opposition. He was considered a mercantile genius, and was the first to keep his accounts in money rather than in gallons, pounds, yards, etc. In 1750 Robert Morris, Sr. gave a dinner party on board one of the ships of the company. As he left the ship in a small boat, a farewell salute was fired from the ship and wadding from the shot burst through the side of the boat and severely injured him. As a result of the accident, he died of blood poisoning on July 12, 1750. Robert Morris, the future signer of the Declaration of Independence, left Liverpool in 1748 at the age of 14 and joined his father in Maryland. Robert was tutored by the Reverend William Gordon but completed only one year of formal education. Restless, he left Maryland in 1748 to live under the watchful eye of his father’s friend, Mr. Greenway, in Philadelphia. Young Robert flourished as a clerk at the merchant firm of Charles Willing & Co. When Robert’s father died in 1750, he was left alone, without family, at the age of 16, in a new continent. Robert set to work, and in his twenties he took some of his earnings and joined a few friends in creating the London Coffee House, an institution which the Philadelphia Stock Exchange claims as its origin. At one point during the Seven Years War (1756-1763) Robert was sent as a ship captain on a trading mission to Jamaica where he was captured by French Privateers. Fortunately he escaped with his crew and took refuge in Cuba, where they scraped out a living. When an American ship arrived in Havana, he returned home to Philadelphia. Around this time Charles Willing retired and his son, Thomas Willing, took over. Thomas offered Robert a partnership position and they started the firm of Willing, Morris & Co. with three ships, which they sent to the West Indies and England, exporting American goods and importing British cargo. The firm also engaged in banking. Robert’s relationship with the Company continued for nearly 40 years, and at the height of his success, he was ranked by the Encyclopedia of American Wealth, along with Charles Carroll of Carrollton, as the two wealthiest signers among the 56 signers of the Declaration. During the Seven Years War the Crown put an embargo on sending indentured servants to America so the king could have more soldiers, and at the same time the Parliament enacted laws encouraging the slave trade from Africa. Willing, Morris & Co. dabbled in this business for a while, but ultimately lost money on it. As soon as they could bring in workers from Europe they dropped the trade forever. Shortly after the Seven Years War, Willing and Morris joined with other merchants in response to new changes in tax policy. In 1765 the Stamp Act was passed, and Robert led a street protest. He convinced the tax collector to give up the post and send the stamps back. The tax collector later wrote that if he had not complied he feared his house would have been torn down “brick by brick.” In 1769, Willing and Morris organized the first non-importation agreement, which ended the slave trade in the Philadelphia region for good. Robert Morris married Mary White on March 2, 1769 and they had seven children. Mary was a sister of William White, bishop for fifty years in the American Episcopal Church. 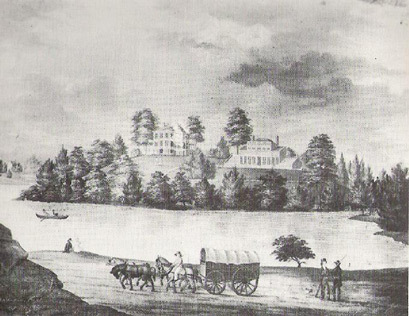 A year later, in 1770, he bought an eighty acre farm on the eastern bank of the Schuylkill River where he built a home he named “The Hills” in an area that is now Fairmount Park. This beautiful estate had a greenhouse where he grew oranges and pineapples, two farmhouses, barns, and various other buildings. View of “The Hills” on the Schuylkill River. Morris was asked to be a warden of the port of Philadelphia, and from this position, in 1775, he convinced the captain of the tea ship Polly to return to England. By this action Philadelphia avoided the kind of violence that occurred in the case of the Boston Tea Party. After the war began at Lexington and Concord, Morris’ company brought in weapons and powder for the militia, while his shipping contacts sent him information about English troop movements. So many supplies came into Morris’s wharf that the Congress posted guards there at night. Robert became increasingly active in the patriot cause. He served with Franklin on the Pennsylvania Committee of Safety, and eventually became its chairman. Later, he was elected to the Pennsylvania Assembly, and then to the Second Continental Congress. Robert Morris hoped his work would result in the English backing down from their course, which was clearly against the British constitution. He did not wish to separate from England because he thought Americans were not ready for self-rule and he feared anarchy would result. He was also worried that the colonists were not really prepared for a war with the superpower of the day. He argued for a peaceful resolution, speaking out against independence. However, Morris was appointed to the Model Treaty Committee following Richard Henry Lee’s resolution for independence on June 7, 1776. This treaty proposed international relations based on free trade, but did not rely on a political alliance. These instructions were taken to Paris by Benjamin Franklin who transformed them into the Treaty of Alliance which made possible the victory at Yorktown in 1781. When the vote for independence was taken on July 2, 1776 Morris left the room so that independence could pass without his dissenting vote. While in Congress Morris was on the Secret Committee, from which he used his commercial contacts as a network of secret agents for the cause. He was a member of the Committee of Correspondence, which would later become the U.S. Department of State. He served on the Marine Committee and was the only member of that Committee for a time, and on the flag committee at the moment when Congress ratified the American Flag during Marine Committee business. He sold his best ship to the Continental Navy and it was renamed the Alfred, and sold a second one, which became the Columbus. He later sold a third which was renamed the Reprisal and it was this ship that took Franklin to France. Many captains who sailed for Morris became naval officers in the Revolution including John Barry, Lambert Wickes, John Green and Samuel Nicholas, who became the first Commandant of the Marine Corps. Before the American victory at the Battle of Trenton, Morris supplied Washington’s army with timely financial aid, weapons and blankets, while also communicating with American agents in France and getting the ships safely to sea. After the British succeeded in taking Philadelphia in 1777 Morris returned to Congress, sitting at York, Pennsylvania, and signed the country’s first constitution, the Articles of Confederation. He was one of only 16 signers of the Declaration who signed both documents. Morris retired from Congress in 1778 and rejoined the Pennsylvania Assembly. While in that body he worked to establish checks and balances and to protect minority rights. For this he was rewarded with a series of vicious attacks on his character and his honor. He weathered the worst his adversaries could dish out, but even today some cling to these false charges as if they were true. The Continental Congress called Morris to service again, in 1781, appointing him the Superintendent of Finance. This was the first executive office in American history. Faced with a serious governmental financial crisis, Morris submitted the first national funding proposal, On Public Credit, which served as the basis for Hamilton’s plan submitted a decade later during the Washington Administration. Morris established the Bank of North America with the help of two other signers—James Wilson and George Clymer. Morris slashed governmental and military expenditures, personally purchased Army and Navy supplies, tightened accounting procedures, and pleaded with the states to contribute, a process he likened to “preaching to the dead.” Before he left office he used over a million dollars in his own notes to feed and pay the troops, with most of those notes to be repaid with loans from France. At the end of the war he took on the mission of repaying the debt to France, but circumstances made that impossible and he lost a fortune in the effort. 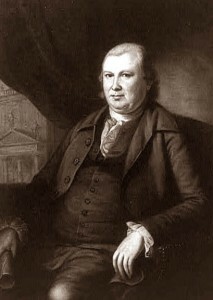 Robert Morris sent the first American ship to China in 1784 which began the country’s China Trade. At one point he had ships going as far as the Levant and India. Morris confided to an old friend that he had lost over 150 ships during the Revolution, but had managed to come out “about even.” This was mostly due to privateering, and selling American goods to the French and Spanish islands in the Caribbean. After ratification of the Constitution, Morris was elected Senator from Pennsylvania. He wrote to Washington at Mount Vernon informing him that he had been elected President of the United States. When Washington became President, he invited Morris to become his Secretary of the Treasury. Morris declined to serve, but then made one of the greatest casting recommendations in American history, recommending his friend, Alexander Hamilton, for the post. Morris served on 41 senatorial committees and used his position in the Senate to support and advance Hamilton’s financial policies, helping him to establish the new Republic on a firm financial footing. 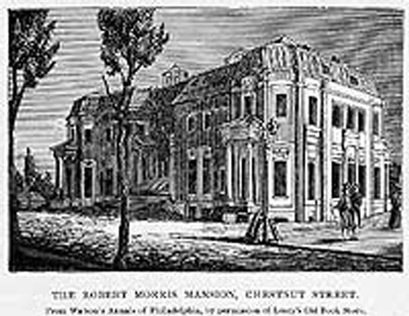 In 1794 he began constructing a palatial townhouse in Philadelphia designed by Maj. Pierre Charles L’Enfant, but his fortunes were soon to take a serious turn for the worse. Morris’s political enemies were pleased to see Morris leave office in 1795, and recommenced their long unfinished investigations into his work on the Secret Committee dating back to the late 1770s. They dismissed the settlement negotiated by their own chosen agent in France, Mr. Barclay, and refused to accept the documentation of expenses that Morris provided. In the end, they charged Willing, Morris & Co., over $94,000. To pay this bill, Morris had to sign over his best remaining asset, his interest in his shipping companies. Robert Morris then plunged into real estate speculation and at one time owned the western half of New York State, which, after making peace with the Six Nations, he sold to the Holland Land Company. He used his new wealth to start an industrial revolution in America and at one point owned a steam engine company, a glass factory, the first iron rolling mill in America, a coal company and several canal companies. He launched a hot air balloon from his back yard a few weeks before a more successful effort took place in Baltimore. He became overextended when Napoleon’s French minister, Talleyrand, did not pay for the 100,000 acres he purchased from Morris. His financial picture began to darken. To make matters worse Aaron Burr, acting as the Attorney General of New York, started a partisan lawsuit against Morris that deprived him of hundreds of square miles of New York property in the process. Much of this land has subsequently become part of the Adirondack State Park. Partners of Robert Morris started buying up thousands of acres in Washington, DC and entangled him in a massive losing venture. They arranged with a group of investors to take over the properties, but after the deal was signed the investors reneged. At one point Morris and his partners believed that they had a new loan from Holland and exercised options for over 6 million acres. The loan failed to materialize due to the French Revolution and the rise of Napoleon and Morris was blamed for a recession in the middle states. His political enemies used this event as the basis for attacking his programs of free market capitalism, and moved their agrarian agenda forward. Morris declared bankruptcy in February 1798 and was taken to Prune Street debtors’ prison where he remained in custody for three and a half years. With Morris in debtor’s prison, and the Federalists weakened, Jefferson won the presidency. Morris’s friend and ally, Senator John Marshall, helped pass a bankruptcy law in 1801 and Morris was released. He attempted to restart his career, but the world had changed and he was discredited. Gouverneur Morris invited him to spend some time with him and provided Robert with an annuity for the rest of his life. Robert Morris lived quietly with his wife for another five years. Robert died of asthma on May 8, 1806 and was buried in the family vault of William White and Robert Morris behind Christ Church in Philadelphia. Robert Morris was 6 feet tall, well built, with sandy colored hair and piercing blue eyes. He walked with a cane, but still managed to ride a horse when it was required. He also suffered horribly from asthma that would sometimes incapacitate him for days at a time. He was a street activist who was comfortable dealing with sailors, but often found himself operating on the international stage. His direct manner would occasionally offend the sensibilities of the more refined members of Congress, but he had a visionary’s insight into men and their affairs. He was patient, but also a risk taker who would often double up his bet when the stakes were high. Robert and Mary Morris were greatly honored and respected by the Washingtons. From a source in the Queens of American Society, we learn that “At Mrs. Washington’s drawing rooms, Mrs. Morris always sat at her right hand; and at all the dinners, public or private, at which Mr. Morris was a guest, that man was placed at the right of Mrs. Washington. George Washington once asked a friend to buy things for him in France that Robert Morris might wish for himself. While Morris never finished school, he helped to found, and is honored, by several educational institutions bearing his name: Robert Morris College with seven campuses in Illinois; Robert Morris University in Pittsburgh, Pennsylvania; Robert Morris Elementary School in Batavia, NY; Robert Morris Elementary School #27 in Scranton, Pennsylvania; and Robert Morris Elementary school in Philadelphia. In Philadelphia there is a statue of Robert Morris between the Second National Bank and Walnut Street, marked with a plaque and some highlights of his career. His house used to stand at the corner of 6th and Market Street in the center of Independence Mall. The mansion he began to build there was never completed, and came to be known as “Morris’ Folly”, and was sold at auction in 1799. On that site now stands a memorial to nine of Washington’s slaves, with no other mention of the significance of the site. In Washington, DC there is a small park near the Washington Monument dedicated to the signers, and one of the 56 granite blocks there is engraved with the name of Robert Morris. Nearby, in the Rotunda of the National Archives, is the mural painting by Barry Faulkner showing a number of the delegates, and Robert Morris is shown in the first row, on the extreme left. In the Rotunda of the U.S. Capitol hangs the famous 12 X 18 foot painting by John Trumbull called “The Declaration of Independence”. Robert Morris is shown in a group of ten seated figures to the left of John Adams. He is the one nearest the viewer, in the yellow coat, seated at a table with a sheet of paper hanging over the desk. Carolyn, the name of George Wilkes Morris does not show up in the descendants. But this does not mean your friend is not related to Robert Morris. I have found over the years a great misunderstanding between related to and descended from. What is the easier way to tell the difference. If you are a grand child (greats do count) then you are a descendant. If you are a niece, nephew, cousin twice removed, to a person, then you are related to that person, but you are not descended from that person. DSDI does not keep track of the relatives, only the descendants, so I can not help much in that quest. A pretty complete genealogy of the descendants of Robert Morris is available from Picton Press, Rockport, ME. The book is “Descendants of the Signers of the Declaration of Independence”, Vol.4, 2nd edition, Pyne, F.W. You may be able to get the book through interlibrary loan, or through Amazon.com. Carolyn, the name you cite does not show up in our records. I am a descendent of Rachel Lord Kenyon, daughter of Mary Morris (b. 1778, d. 1855) and Ebenezer Lord (d. 1849), who are buried at Porters Corners Cemetery, Barrington Township, Yates County NY. Several online genealogies claim that this Mary is the daughter of Robert Morris, signer of the Declaration, in which case, Robert is my 5th G. Grandfather. But I can find no evidence, apart from these web genealogies, that Robert even had a daughter “Mary”, though he apparently did have a “Maria”. Our “Mary” was apparently born in Monmouth Co., NJ and not in Philadelphia. Did Robert have a daughter named Mary, born in 1778? Steve, we get this question about Mary Morris, daughter of the Signer, Robert Morris, all the time. There are several Robert Morris patriots from the Philadelphia area, and I suspect that your Mary is a daughter of one of those. I can confirm that the Signer did not have a daughter named Mary. I have found several online family trees that are making the incorrect and undocumented claim that the Signer had a daughter Mary, b. in 1778. I have asked each to remove the incorrect data. I am trying to determine if this painting on panel could be that of Robert Morris. The painting is not signed. The features that I have compared with that on the internet are similar. Any and all considerations are welcome. Judy, I suspect you will need to take this up with an historical art expert. We are certainly not that. 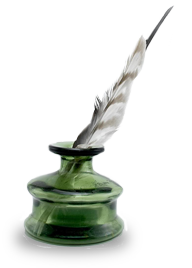 I would also consider contacting the National Park Service in Philadelphia as they have a comprehensive set of art about the Signers and may be able to offer you some guidance. Sorry I am so late in responding. I very much appreciated your directive for further exploring the answer to my inquiry. I am helping a cousin who was told by his father (now deceased) that he is a descendant of Robert Morris through his grandmother Alma Morris, born May 27, 1886 in Missouri, died November 8, 1972 in Orange county. Her married name was Alma Buckley. We cannot find the name of her father. Do you have any record of an Alma Morris as a descendant of Robert Morris? Thank you for any help you can give. We have no record of an Alma Morris in the list of descendants of the Signer Robert Morris. We also have no rcord of this family being born, marrying or dying in the state of Missouri. Wondering if a Ruth Morris born january 7th 1902 shows up as a descendent of Robert Morris. We have no record of Ruth Morris, b. 7 Jan 1902 in the Morris genealogy. I am writing on behalf of my mother in Law, Elizabeth Morris, she is the daughter of Robert Morris, born in Peru, to Victor Voughn Morris and Maria Vargas. Roberto, we do not have any record of a Victor Voughn Morris or Maria Vargas in our genealogical records. Do your records show that a Vincent William Morris shows up as a descendant of Robert Morris, signer of the Declaration of Independence? Nice story! This is my 8th Grate Grandfather and I enjoy reading about him. Stephanie, you present an interesting genealogical statement. 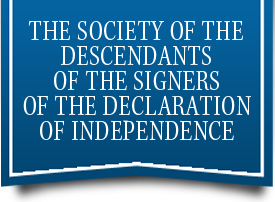 If you are the 8th Great grandfather, then you are a 10th generation descendant of the Signer. Our records stop with the eighth generation, and include surnames such as martin/May, Reeves/Timmins, Lander, Collins, and Morris. I would encourage you to submit an application to the Society so that we may add to our knowledge of this Signer. Hi Stephanie, My grandfather was also named William B. Morris. He died in Chester,PA. in 1961. He was born in the late 1800’s. His wife was Annie V. Long Morris. They had 14 children starting in the early 1900’s around 1910 and ending in the 1930’s. There were six boys and 8 girls my father was the youngest son born around 1929 and had one sister younger then him. One of my older Aunts told me that we were direct decendants of Robert Morris. I am trying to find out my family connection and was wandering if you could help me. Please e-mail me if you have anything that could help. My e-mail is billbob5898@yahoo.com thank you for any help. I forgot to list the names of my aunts and uncles just in case you would like them. My uncles were William, George, Franklin, Paul, Robert and my father Nelson. My aunts were Doris, Genivive, Pearl, Marie, Ruth, Elsie, Annie and the youngest was Helen. Due to a big move from Pa. to Al I have lost touch with them and I dont know if any are still alive. This gives you a little insight to my family just in case you wanted to know I hope you can give me some help please. Do your records show a Grace Edna Morris, born in Kansas in 1890, as being a descendant of Signer Robert Morris? Thanking you in advance for your courtesies.